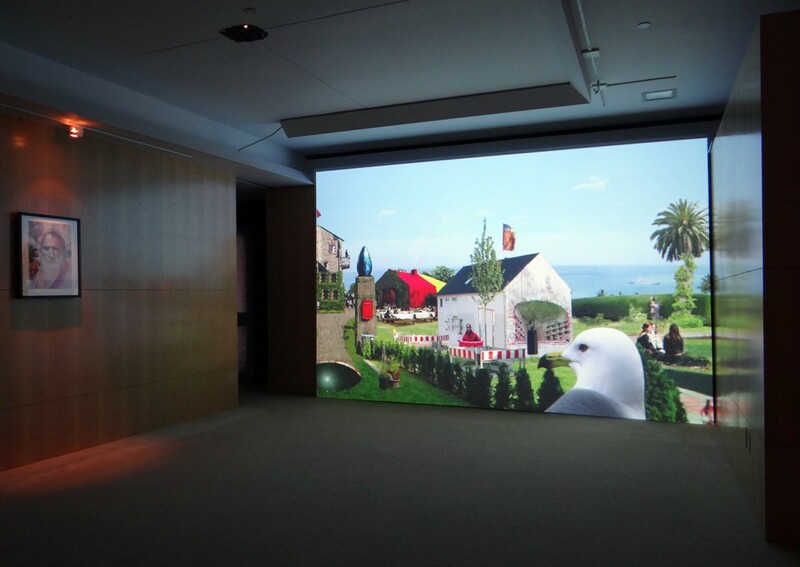 Atlantic Garden is a video panorama showing people from different ideological backgrounds grouped around a mansion. 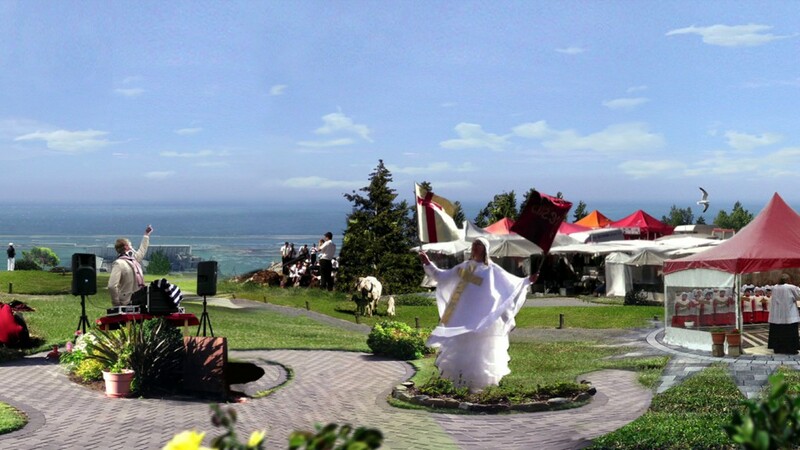 Fusing idyllic environments reminiscent of 19th century romanticism and the contemporary ecological movement, the view pans along a cultivated garden with the backdrop opening up to a seaport and, finally, to an ancient amphitheater. The embedded scenes involve amongst others a party-DJ, a childrens church choir, symbolic animals and a political activist. 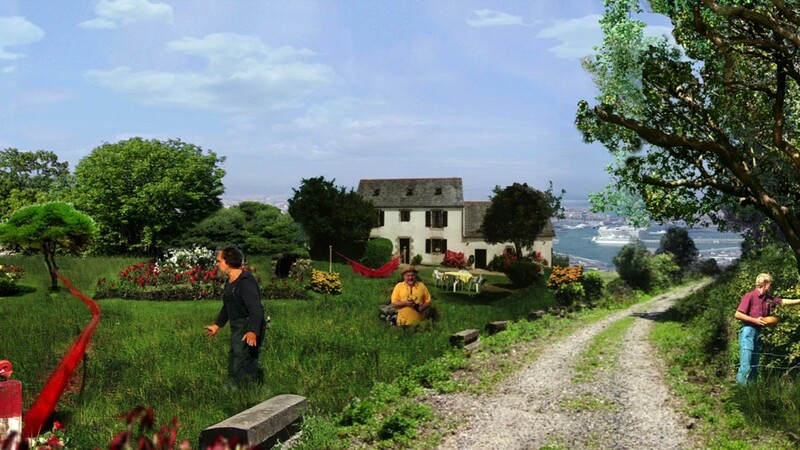 Ulu Braun’s Atlantic Garden (2010) is a video collage depicting a slow, rotational pan around the center of the grounds of an unidentified coastal mansion. It is composed of animated gifs and video clips superimposed upon still images of the scene. On the surface, it is unclear whether Braun is sifting through associated memories of seaside vacations or compressing a cross-section of the European socio-political landscape. A closer look at some of the subtleties and technical aspects of the video prompts the latter interpretation. One of the most striking and meaningful features of Atlantic Garden is Braun’s utilization of timescale. The use of shorter, repeating video clips and looped gifs atop the continuously progressing background emphasizes the separation between montage elements. It essentially creates isolated micro-environments of time within the greater container of the video. The selective sound editing of the video actually enhances this effect. Each micro-environment peppers the landscape with a slice of activity that proceeds independently from the others. Given the languages spoken and the predominantly Caucasian guests, it seems quite clear that each bubble of activity was transported from various regions of the European Union. The key to decoding Braun’s Atlantic Garden is perhaps contained within the mood of the sentiments of those characters who are given speech. They neither address the camera nor one another ‚“ they simply gaze off in introspection, as if trapped in the cells of Braun’s purgatorial panopticon. The Spanish speaking man laments that his plants will not drink. The seated man speaking German explains that he did not to go to demonstrations due to his father’s influence, which did not win him any friends. The English-speaking female discusses sharing meals, perhaps at a potluck. They allude to existential problems of place, growth, change, and sharing amidst the background noise of religious ceremony and techno music. Given political instability and persistent financial difficulty in countries like Greece, Spain, and Italy, fracture lines have formed and prompted a reconsideration of what the union in Europe means. How will these nations act as a whole when future becomes present and the rituals and traditions of the past become less and less relevant? ‚˜What are we?’ the collective figures seem to ask. There is a pronounced presence of children playing and romping about the island landscape. Braun indicates a tinge of pessimism for the future as he shows us a young girl struggling to keep her balance as she mimics the twirling action of an elder flag-bearing female. Braun saturates the peaceful, placid island celebration with social contemplation through juxtaposition, technical imperfection, and symbolic gesture. He gives us pieces to a puzzle, but not ones that snap together. Braun incorporates the animated gif into a greater context of moving collage, giving it a functionality analogous to Richard Hamilton‘s paste-applied tootsie pop clipping from Just what is it that makes home so different, so appealing? (1956), but with the few extra layers of meaning that come with the territory of the medium. 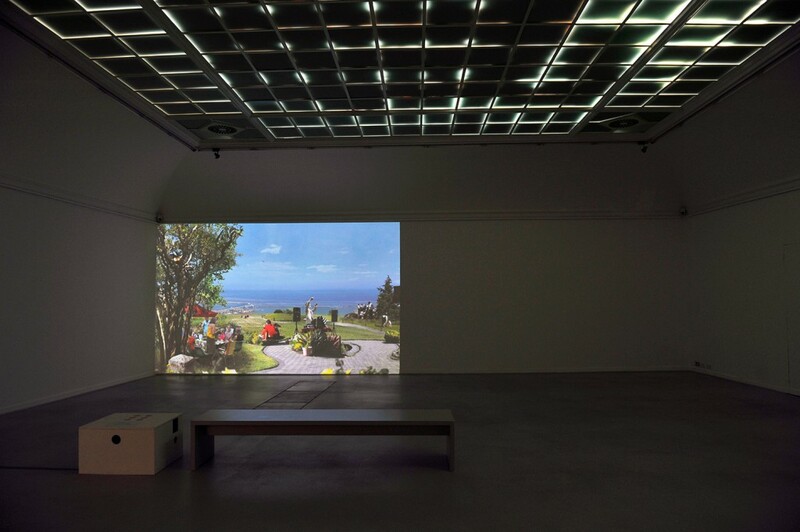 Ultimately, Atlantic Garden smartly utilizes some of the subtleties of video montage to present the current European political and social landscape in order to prompt a consideration of what it feels like to be European today. Perhaps from the viewpoint of the International Space Station, Europe looks something like a garden floating in the Atlantic. Ulu Braun (*1976) gehört zu einer neuen Generation kritischer Romantiker, der existenzielle Themen intelligent mit den Mitteln moderner Ironie, Mystik und poetischer Überraschungseffekte umsetzt. Ein immer wiederkehrendes Thema seiner Filme und Collagen ist die Anziehungs- und Abstoßungskraft künstlicher Paradiese gleichermaßen. Ulu Braun greift dafür auf vorgefundenes Material zurück, nutzt eigene Dokumentaraufnahmen, aber auch Bilder aus Fernsehsendungen und dem Internet. Aus diesen Vorlagen erstellt er einen Film, der ohne klassische Schnitte auskommt, sondern den Bildraum in einem langen Schwenk überblickt. Wie in futuristischen Gemälden stehen zeitlich nicht kohärente Elemente nebeneinander, die wie in dadaistischen Collagen auch in ihren Dimensionen nicht zueinander passen. Dennoch rezipieren wir den langsamen Schwenk über die dargestellte Szenerie wie ein Landschaftsgemälde. Sein jüngster Film, ATLANTIC GARDEN, der im Springhornhof Premiere haben wird, ist die Konstruktion einer Landschaft, welche unterschiedliche Aspekte von Traditionalismus und Globalisierung an einem Ort vereint. Ulu Braun zeigt uns eine idyllische Küstenregion in der die unterschiedlichsten Leute und Gruppierungen friedlich und im Einklang mit der Natur nebeneinander existieren. Tanzende Derwische, spirituelle Prediger, fröhliche Landkommunarden, beseelte Esoteriker, ökologisch motivierte Weltverbesserer und prachtvoll gewandete Akteure eines Mittelalterspektakels tummeln sich unter ewig blauem Himmel. Das Video verbindet Idyllen der westlichen Landschaftstradition und die Visionen diverser Heilsbringer zu einem Panorama, in dem das oft Gesehene poetisch wirkt und geheimnisvoll erscheint. In seiner Überhöhung und Potenzierung wird das gesellschaftliche Idyll zwiespältig. Es schleicht sich eine Ahnung von der Beschränktheit und dem unterschwelligen Machtansprüchen ein, mit der sich gesellschaftliche Utopien in ihr Gegenteil verkehren können. Ulu Braun spielt inhaltlich und formal offen mit der Erzeugbarkeit von Landschaften einschließlich der vielen kleinen Geschichten, die sich darin abspielen. Damit reizt er nicht nur zu direkten Vergleichen einzelner Bildelemente mit bekannten Filmen oder Gemälden, sondern verarbeitet relativ respektlos auch gleich die allgemeine (kunst)historische Entdeckung der Landschaft als menschlicher Bezugspunkt durch Petrarca und Dürer, ihre Idealisierung durch Lorrain, die Feier ihrer sublimen Wirkung durch Friedrich, Goya und Turner, aber auch ihre surrealistische Überformung durch Dali­, Ernst und Tanguy. Möglich ist dies, weil es sich um eine künstliche, aber keine Phantasielandschaft handelt, die im Grunde nur aus dem immer verworrenen Nebeneinander von bewegten Bildern besteht, aus dem wir alltäglich in unserem Fernseh- oder Videokonsum via Internet ganz von alleine solche Landschaften zusammensetzen.